This is what happens when you are forced to announce to a table of diners that you are a vegetarian: two people will look dismayed, one person will avoid eye contact to communicate disinterest in the moral tirade you are presumably about to launch into, and one person will say “But what do you eat for protein? !” in an “explain yourself” tone. I’m always tempted to respond, “What form of birth control do you use?” Because that is as much everyone’s business as are the fine details of my diet. 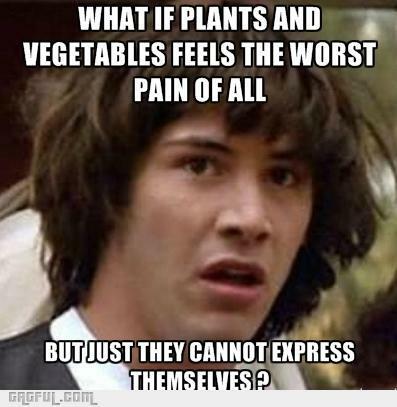 It’s interesting how being a vegetarian opens your eating habits up to group discussion and critique. 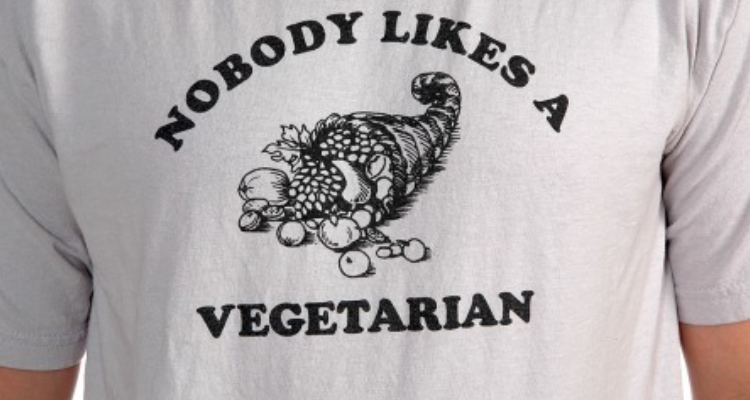 A coworker once complained to me that her daughter-in-law is a “bad vegetarian” (is that like a bad Catholic?) because she asks that her mother-in-law not go out of her way to make an all-vegetarian dinner when she comes over and instead just eats the salad and bread. Maybe her daughter-in-law doesn’t want to cause her host anxiety or inconvenience, and is happy forgo stuffing her face in order to enjoy a relaxed visit with friends and family where her diet is not the main topic of conversation. Just a thought. Guest: Where’s the meat? Did you forget the meat? Explain the absence of meat, please. Host: Well, as you know, Suzie is a vegetarian, and if she won’t eat it, no one else can have it! Let’s not forget to ask her whether it’s an ethical or health-related choice. In fact, people need less protein for a balanced diet than we think, and vegetables contain more of it than we realize. I sometimes worry that people will be so overwhelmed thinking they’ll have to make a separate dinner just for me, that they may hesitate to invite me in the first place. I don’t want that. Sometimes the reaction you get is just funny. At an event where the lunch served was just hamburgers, hotdogs and potato salad, I asked for a hamburger bun to make and sandwich of the cheese, lettuce and tomato meant to go on the burgers. After a lengthy discussion with not one but three servers, I was able to communicate that I didn’t need a hamburger. They were beyond confused. I had to ask them to “just trust me.” Granted, this was at a gun range, so I don’t imagine they have a lot of vegetarian visitors. I get that the concerned parties here are well-meaning, but besides the occasional noob or trend vegetarian who will only last a few months, most of us have been eating this way for years and we’re comfortable managing our diet so that we don’t experience adverse effects. Our hair isn’t going to fall out. So trust us when we say salad is fine. We don’t need to talk about it.